On the 110th anniversary of his birth, we feel a sense of homage to that universal, lovable and essential figure of Our America, the great precursor of the left cycle that began in December 1998 in Venezuela. June 26 (teleSUR) It is well known that with the triumph of the Cuban Revolution in 1959, Latin America and the Caribbean resumed their march towards their second and definitive independence. The rise of Hugo Chavez to the presidency of what would become the Bolivarian Republic of Venezuela is usually considered the second milestone in this long march. While that is true beyond doubt, it, however, leaves out a very important intermediate stage, brief but of enormous importance: that of Salvador Allende and the Popular Unity in Chile, between 1970 and 1973. A stage we must rescue from oblivion in which it has been buried by the right-wing’s propagandistic apparatus inside and outside Chile. Allende arrives to the Palacio de la Moneda (Chile’s presidential palace) with a government program that has nothing to envy from the ones the Bolivarian governments of Venezuela, Bolivia and Ecuador would later attempt to implement in a much more favorable economic, international and political context. Man of unshakeable socialist convictions Allende did not delay a second in applying the Popular Unity program, adopting transcendental measures like the nationalization of Chile’s wealth: the great copper, iron, saltpeter, and coal mines held by foreign companies -among them the giants Anaconda Copper and Kennecott- and national monopolies. With an initial investment of about US$30 million, after 42 years, Anaconda and Kennecott sent abroad profits of over US$4 billion. Not satisfied with this, Allende nationalized almost Chile’s entire financial system: private banking and insurance companies, acquiring under favorable conditions for the country the majority of share of its main components. He nationalized the International Telegraph and Telephone (IT&T), which held the monopoly on communications and organized and financed, together with the CIA, a terrorist campaign to prevent the inauguration of the socialist president. Allende also recovered Chile’s large steel company, created by the state and then privatized. He accelerated and deepened agrarian reform, which had been advanced with slow and hesitant steps by his Democratic-Christian predecessor. Applying an almost forgotten law of the fleeting Socialist Republic of Chile (June 4 – September 13, 1932), which enabled the president to expropriate companies paralyzed or abandoned by their owners, Allende established an “area of social ownership” in which the companies linked to Chile’s economic and social development (such as foreign trade, production and distribution of electric power, rail, air and maritime transport, communications, production, refining and distribution of petroleum and its derivatives, iron and steel, cement, petrochemical and heavy chemical, cellulose and paper) came under state control. Allende did all of this in the few years of his administration, apart from creating a great people’s publishing house, Quimantu, to bring universal culture to Chileans and to restore dignity to a people subjected to the yoke of a fierce neocolonial oligarchy for decades. All of this, absolutely all of this, was done in the Popular Unity government without stepping out of the prevailing constitutional and legal framework. Despite this, the old oligarchic right and major sectors of Christian Democracy crawled without the slightest restraint through the mud of disgrace, throwing overboard their (always scarce) respect for democratic norms to serve as local agents for the criminal maneuvers of United States imperialist reaction. Maneuvers that had been unleashed by Washington on the night of September 4, 1970, when the votes that would give the Popular Unity its victory were still being counted. Furious, the bandit Richard Nixon, ordered the sabotage of the impending Allende government at any price. The assassination of the constitutionalist Army General Rene Schneider, shortly before Congress ratified Allende’s triumph, was only the first link of a gloomy chain that with Augusto Pinochet’s dictatorship would sow death and destruction in Chile. Allende’s permanent solidarity with the Cuban Revolution and with all the emancipatory causes of the time, before and after assuming the presidency, was another factor that ignited U.S. anger and its decisive decision to bring about Allende’s end. 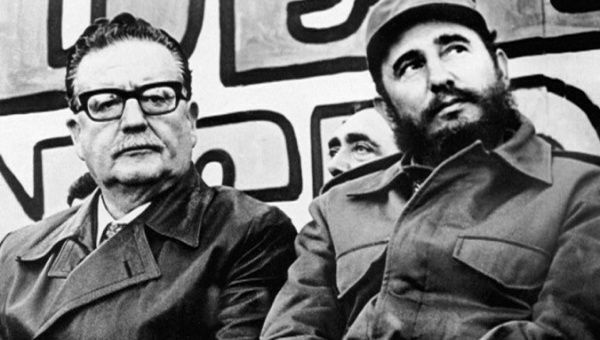 In 1967, as President of Chile’s Senate, Allende accompanied Pombo, Urbano and Benigno, the three survivors of Che’s guerrilla in Bolivia, to guarantee their safe return to Cuba. But Allende, a Marxist without fissures, did not yield an iota, neither in his convictions nor in the policies pursued by his government. And he paid for it with his life, as he said in his final address on radio Magallanes on that fateful September 11, 1973. This June 26, on the 110th anniversary of his birth, we feel a sense of homage to that universal, lovable and essential figure of Our America, the great precursor of the left cycle that began in December 1998 in Venezuela.